Urbanization puts strain on education systems: In China in 2004, one-fifth of the 120 million internal migrants had less than a primary education. Of the more than 25 million refugees in 2015, 60% live in urban areas and half are under age 18. In Turkey, only 30% of refugees in urban areas were in formal education. Education helps reduce inequality in cities by giving people vital skills for work: Street vendors make up one-third of urban employment in India and one-sixth in South Africa. Education reduces crime in cities: In the United States, if 5% more men graduated from high school it would add US$20 billion to the economy via reduced crime and higher earnings. Education improves cities’ prosperity and makes them green: Some 18,000 firms created by Stanford University alumni are based in California, in urban areas. In countries with cycling cities, such as Denmark, Germany and the Netherlands, children receive safe-cycling training in school from an early age. Urbanization is one of today’s defining demographic trends – over half of the world lives in cities and urban areas, and most projected urban population growth to 2050 will happen in lower income cities. The GEM Report looks at the ways cities and urbanization affect education, and how education affects urban issues. The scale and speed of urban change necessitate good governance, flexibility and innovation. Education should be integrated into urban planning so that the education needs and rights of all are met as urban populations change. But the broad education sector is largely missing from key urban development discussions. Education stakeholders and urban leaders need stronger advocacy and leadership if education is to gain a seat in discussions on the future of cities. Globally, about half of urban growth is due to natural population growth and half to migration from rural areas. Such growth raises demand for basic education, lifelong learning, skills development and teachers, and increases the need to foster social cohesion and tolerance of cultural diversity through education, including for slum dwellers, migrants and refugees. More than one-third of urban residents in lower income countries live in slums or shanty towns in city centres or urban peripheries. Slums’ conditions vary greatly, but many are characterized by poor access to basic services, including education. Data compiled from 130 slum settlement profiles from 12 cities and towns in Uganda found that while most settlements had access to schooling, the respondents highlighted the need to increase the number of accessible public schools. Migrants to cities looking for employment face challenges such as discrimination, language barriers, unemployment and exploitation in the informal economy. Addressing these requires a focus on skills development. Urban education systems that receive forcibly displaced children and youth need to adapt to support their long-term integration — particularly as the global refugee crisis is deepening. By late 2014, 6 out of 10 refugees lived in urban areas. More than half the world’s refugees are under 18. In Turkey, 85% of Syrian refugee children in camps attend school, compared with 30% of those in urban areas. The prevalence of private schools, especially in major cities and peri-urban areas, is often underestimated or disregarded in discussions of public education. Their growth in peri-urban areas is mostly informal, often not captured in official statistics, and critically neglected. The 2010/11 private school census of Lagos state, Nigeria, revealed that over 85% of pre-primary and 60% of primary students were enrolled in private schools. Good quality primary and secondary education and high enrolment rates in tertiary education are fundamental for fostering innovation and increasing productivity in knowledge economies. Cities attract human capital and foreign direct investment by positioning themselves as global hubs for higher education, skills, talent, knowledge and innovation. The megacity of Shanghai, China, attracts a wide range of talent, has access to over 100,000 graduates and has doubled the proportion of college-educated labour force in a decade. Stanford University has reportedly had significant global economic impact: 18,000 firms created by its alumni are based in urban areas of California. Informal work is a major source of employment and income in lower income countries, especially in cities, and an important stopgap employer in higher income economies during economic crises. Recognizing and including informal work in urban economies is important for prosperity and social inclusion in cities. Education also has a positive social impact, particularly in reducing crime. In England and Wales (United Kingdom), prolonging compulsory schooling has led to a major reduction in crime and violence. In the United States, investing in early childhood education has had long-term effects on reducing crime in adulthood. Education can improve awareness of environmental challenges and responsibilities in cities. Educational tools have been important in the mass adoption of bus rapid transit and cycling. In Lagos, Nigeria, an extensive communication programme on a new bus rapid transit system helped reduce implementation delays. In countries with cycling cities, such as Denmark, Germany and the Netherlands, education is woven into an integrated approach with children receiving extensive training from an early age. To ensure that education does not exacerbate social stratification, governments need to balance education-related activities that can improve a city’s competitiveness with those that can improve social inclusion. 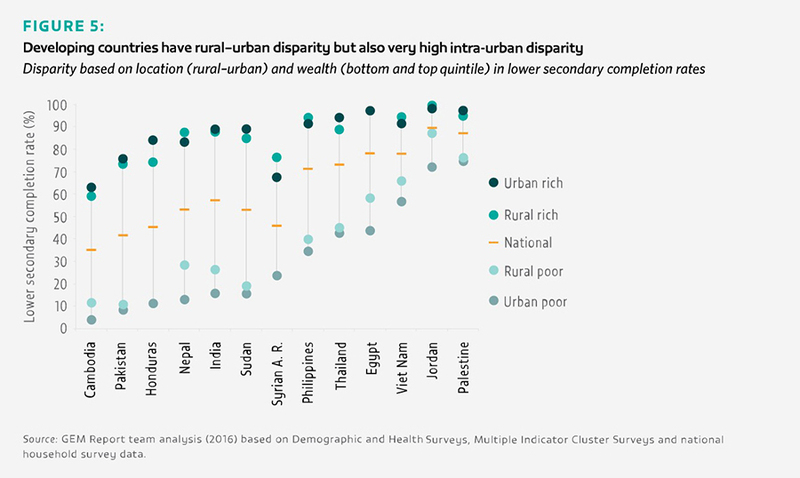 There is as much – if not more – substantial inequality in education within urban areas as between urban and rural areas. The potential benefits of being in an urban area can be undermined by a lack of policies addressing inequity. Discriminatory policies and practices, such as inequitable distribution of good teachers, can also exacerbate inequality. In the Concepción metropolitan area of Chile, major differences were found in the distribution of schools of good quality. Private schools, often resulting from poor government provision, can both alleviate and exacerbate inequality. School choice – allowing parents to choose between public, private, charter or other non-state institutions – is often both a cause and consequence of demographic stratification. Inequality in education can be perpetuated by negative attitudes. Teachers routinely exhibit discriminatory attitudes towards children of migrants and minorities, which can contribute to their social marginalization. In Shanghai, first-grade teachers were more likely to report that migrant students performed below their grade level in language, even after controlling for background characteristics. Education can also perpetuate social exclusion if schools serving the disadvantaged are violent. Segregation by ethnicity, social class or race is a dominant feature of education in cities in the United States, much of Europe and countries with legacies of troubled race relations, such as South Africa. Education-based segregation is greater in high tech, knowledge-based metropolitan areas. In 90% of the 30 largest US metropolitan areas, segregation between upper and lower income households has increased. Research from 13 major European cities indicates that socio-economic and spatial segregation is rising as more educated populations fuel the growth of knowledge-intensive industries. Education has the potential to influence urban planning, if part of an integrated effort. In Berlin, neighbourhood management projects have been launched to create a ‘socially integrative city’ through activities, education and employment opportunities. Realizing this potential requires better multidisciplinary training enabling urban planners to work effectively across disciplines and sectors to promote more sustainable living environments. In most countries, urban planning schools and programmes are limited. India has about 1 planner for every 100,000 urban residents, compared to 1 for every 5,000 in Canada and the United States. Education-led participatory approaches, recognizing the needs of the disadvantaged, improve urban planning and decision-making. Shack/Slum Dwellers International network has helped community members document inequalities and demand services from local government. In partnership with the Association of African Planning Schools, it has engaged in efforts to increase the relevance of urban planning, especially in relation to informal settlements. Informed city leaders can productively use education and lifelong learning to transform cities. In Medellín, Colombia, the mayor helped transform the city from one of the world’s most violent to one of its most innovative through an education-led social change strategy. As cities grow increasingly important, improving local autonomy and emphasizing education strategies are key to making them sustainable and inclusive.